France is one of the main holiday destination in the world. Indeed, it’s one of the rare place where you can go in every season. Today we give you the 5 most beautiful beaches to see so you can make your choice for your holiday/week-end! Because France is only famous for two places: Paris and The French Riviera. But you have to know that the best beaches aren’t in Monaco or Nice. This beach is perfect: beautiful, turquoise, close to the center of Biarritz but not at the foot of buildings, really large, a good place to surf as well and the best place to spend the day and the night on during your holidays. And the city of Biarritz is one of the best place of France thanks to its amazing-friendly peoples and perfect weather. If you want heavenly small beaches, with soft sand and clear blue water, this is the perfect place for sure. And we don’t need to tell a lot about it instead of the thing that its really far from cities, few little restaurants are situated along the beach so you can spend the day here, and it’s always sunny in Corsica. If you have a doubt, go and check it on Google Earth. Still in Corsica, this beach is one of the smallest of France! If you go out of the high season, you will feel alone in the world on a heavenly white sand beach. This small “hidden” beach is about 20 mins walk from the parking and is a protected cove with lovely vie of the Cavallo and Lavezzi islands. This beach is the beat place to go during the end of the day, enjoying the sunrise. You will need to climb 114 meters of sand (a scale of 154 steps is here to save you) but it really worth it. Because once you are at the top, the view is just amazing. This beach is more the kind of beach where you go if you want to surf / sail or to enjoy the waves. It is 5 km long and it is still very wild, preserved and it is a kind of loophole of usual beaches. It is the typical type of wild beaches of the west of France and you need to see it! Clichés, common preconceptions, are really tough and most often wrongs, but it’s really hard to parted with its. Discover the 5 main cliché about India and why they are wrong. For European people, India is the paradise of naan cheeses. Those little leaves of bread full of tasteful cheese are obviously delicious, yes, but does not exists in India! It’s something you can only find in Europe. Actually, it will be hard for you to find any cheese in India because it’s not something very popular there. But when you look to their richness of cooking, there are so many delightful things better to try than a little piece of bread with industrial cheese inside. First of all, Hindu is not a language but the name for people member of Hindu religion. It is just like saying that Muslim people speak Muslim. And they don’t speak Indian either. There are more than 20 dialects in India spoken according to the different part of the country you are. Anyway, even if India is the second largest English speaking country of the world, not everybody there speaks it but only the people who went at school. You will consequently need to learn how to speak with gestures, but that’s pretty easy! First, you need to know that Bollywood movies are only the industry of the north of India, means that there is other different industry in different parts of the country. And even if it is a lot of dances, flowers, and love stories; there are also a lot of social movies really interesting. Cinema in India is livelier than in Europe: people react, scream, laugh, applause and feel the movie at 100%. Yes, India is not a clean country, but there is a huge problem of overpopulation still not fixed. And they do not have the money to clean properly the streets. But that does not mean that everything is dangerous. There are only two rules to memorize: only drink water in bottle and do not eat not-cooked food because it’s often washed with water. But as long as you eat cooked meal, there is no problems. Quite the opposite the food is really spicy but incredibly good. With its picturesque network of canals and its rich history and culture, Amsterdam is one of the most popular tourist destinations. The city offers an endless selection of attractions to see and fun things to do. From cycling around the city to visiting museums, here’s what to see and do on your trip to the Netherlands’ capital. Taking a cruise on the waters of Amsterdam is a must! There are countless boat trips that take place every day, with several routes to choose from, which provide tourists with a fun and exciting way to explore the city’s canals and attractions. There are various types of canal cruises to choose from, from hop-on-hop-off sightseeing tours to romantic candlelit night time cruises with food and wine. The idea of eating raw herring might sound scary at first, but you simply must give it a go! You can always ask for ‘broodje haring’ to get the fish served in a small sandwich with pickles and onions. The best time to try raw herring is between May and July when the fish’s flesh is said to be at its sweetest. You can find herring carts serving up this Dutch specialty around every corner. Every visitor to Amsterdam should give this fish a go as it makes for an authentic Dutch eating experience. Home to the Rijksmuseum, the Van Gogh Museum and the Stedelijk Museum of Modern Art, Museumplein is the cultural centre of Amsterdam and the best place to soak up some of the city’s culture. This district offers open-air exhibitions, markets and a large pool perfect to dip your toes in on warm days. In the winter months, the square transforms to a large outdoor ice rink. The museum of Vincent Van Gogh holds the world’s largest collection of Van Gogh’s work as it includes more than 1000 of the artist’s paintings, drawings and letters. The building of the Dutch impressionist is a must-visit attraction as it offers visitors the chance to get up close with his works as well as learn more about the artists who were inspired by him. Rijksmuseum is counted as one of Amsterdam’s top museums as it contains a lot of Dutch works from the 15th to 17th centuries, and features an impressive collection of works from artists such as Rembrandt, Vermeer, etc. Thanks to recent renovations, the museum was restored to its original glory, leaving visitors impressed with both the renovations and the collections inside. Amsterdam is known for being one of the most cycle-friendly cities in the world, and cycling in Amsterdam is a way of life. All the cycle lanes and routes make cycling easy, safe, and enjoyable! It is incredibly quick to get around on two wheels so there is no better way to explore the city of Amsterdam and discover its sights and attractions. Finding a bike to rent will not be a problem as there are plenty of rental shops around Amsterdam so join the locals and hop on a bike to explore the city’s streets! This museum represents a dark and airless space where Anne Frank and her family used to hide for a period of two years from the Nazis. Anne’s room has been preserved to give an idea of what life was like for Anne and her family. Anne’s famous diary situated in a glass case as well as a range of videos at the end of the tour showing real-life scenes from concentration camps make for a powerful experience. When touring around the city of Amsterdam, you will most probably smell the delicious aroma of freshly baked waffles. Waffles are extremely popular in the Netherlands and there are shops you can get them from all over the city of Amsterdam. Waffles have different variations based on their stroopwaffel, which is made from two thin layers of grilled waffles stuck together with melting caramel. If you are a fan of sweets, the tasty waffles will be heaven in your mouth! With more than 200.000 restaurants in its metropolitan area, Istanbul is one of the best place on earth to enjoy street food. 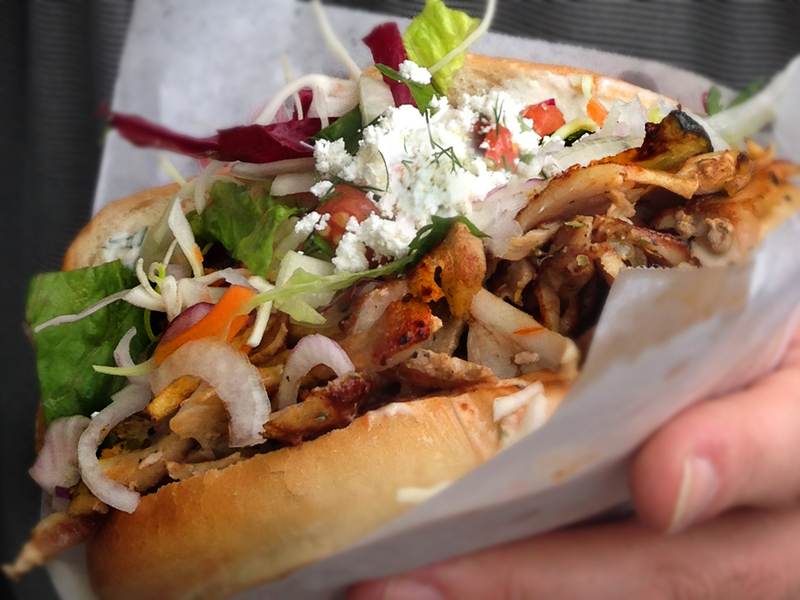 We compiled 5 delicious street food essentials you have to try while visiting Istanbul. Also called the “Turkish pizza”, lahmacun is a round thin piece of dough topped with minced spices, herbs, onions, tomato and meat. Often served wrapped around vegetables, lahmacun (which means “meat with dough” in Arabic) is a really simple dish that had been forgotten for decades but which is increasingly coming back in Turkish trending street food. Simit is probably the most famous bakery in Turkey. A circular bagel-looking bread encrusted with sesame seeds, nothing more, nothing less, as simple as that. Istanbul is known to be the city where molasses is added on simits making it even more delicious. Istanbul is also known to be the hometown of this popular bread: archival sources show that simit has been produced in the Turkish capital since, at least, 1525. Fish lover? 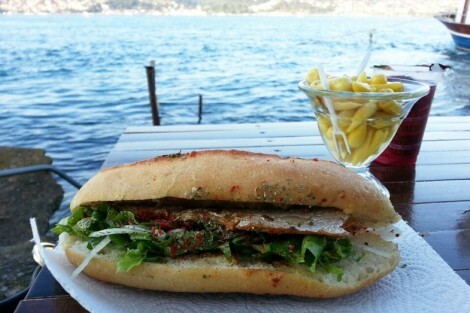 You definitely need to try this wonderful fish sandwich while walking around Istanbul shores. Deep fried fish (usually mackerel), onions, tomato, lettuce and bread, these are the really simple ingredients of balik-ekmek. Served from floating shops, cheap and tasty, this sandwich is without a doubt one way to enjoy your Turkish experience. Kokoreç is a notorious yet controversial Turkish street dish. Made of spiced offal wrapped in lamb intestines, the whole is often served in half a baguette or on a plate. Loved by Turkish people it is cooked and sold in small kiosks year-round and served 24/7. You can book your taxi transfer from/to Istanbul airport here. One of the best way to travel and to discover the world as you never saw it before is to road-trip. You take your car, and go on the road to discover the places you always wanted to, stop whenever you want, sleep wherever you want, and live free. And there is in this world, some places which are so perfect to travel like this. The best place to road-trip, according to many travelers (and also to theplanetd.com) is the very famous “Wild Atlantic Way” in Ireland. It is simply the longest coastal road in the world, running 2500km up the western coast of Ireland. Every day travelled there offers you incredible landscapes you never saw before, huge sea-cliffs that will give you goosebumps, and beautiful desert beaches to enjoy (even if the water is not really warm). The duration can goes from 2 to 4 weeks according to you. We give you here 5 insane spots to see during your amazing trip from the north to the south of the Ireland! Portsalon beach is based in the county of Donegal, home of the finest beaches of Ireland. And, by the way, this beach has been voted as the second most beautiful beach of the word. If it is so exceptional, that is because it gives a great view of the Inishowen Peninsula (a place that you also need to see) and that you can admire spectacular sunsets. This place is basically based on amazing coastal cliffs where you can watch the huge waves crashing and making some terribly noise. And the shittier is the weather, the better it is for you because waves will be more powerful. You will may be enough lucky to meet the ‘Prowlers’, which are basically enormous waves reaching around 100ft high; waves that you can see nowhere. Not really the best place to have a swim. The coast of Mayo is the departure gate of many smaller islands, desert most of the time. The biggest one is the famous Achill island, home of beautiful white sand – blue water beaches, typical Irish pubs and great walking tours to visit the island from top to bottom. This island gathers everything you need to see in Ireland. The access is via a road bridge. One of the most visited area in Ireland is probably this place. This the most prominent place of Ireland, and if you don’t visit it during your road-trip, it will not be a fulfilled trip. But try to go there in a sunny and cloudless day to enjoy the craziest view of Ireland. Because when the sky is clean, you can see Aran Islands, Galway Bay, the Dingle Peninsula and Blasket Islands in Kerry. Spectacular. Mizen head will be one of the latest place you will visit, in the southern Ireland. You will first need to climb down the steps at the edge of the peninsula and visit along the arched suspension bridge above the unrelenting sea and the violent waves until reaching the point where you can not go further. Your road-trip will be almost ended. Take a few hours to enjoy the sea, the superb view and to focus on the peaceful noise of the waves, crashing on the cliffs. A finish in a high note. Click here and book your taxi from and to Dublin airport. Sri Lanka is the kind of amazing country not already overrun by world tourists. The island, situated under India, has a real strong culture and a-plenty of breathtaking and pristine landscapes that you will never see elsewhere ! Sri Lanka is a beautiful country in the south of India, with maritim borders with India and Malaysia. It is a multicultural country, home of many religions, ethnic groups and languages. But it has especially a big Buddhist heritage. This place attracts more and more travelers every year specially because of its natural beauty, of its culture-mix and its heavenly white-sand beaches. Here are 5 things-to-do on FOR an island which has been on the tourist map for some time, Sri Lanka remains remarkably unspoiled. A perfect place to visit if you fancy dropping out and trying the Robinson Crusoe lifestyle for a few days – with civilisation never too far away. Sri Dalada Maligawa, also known as The Temple of the Scared Tooth Relic, is a Buddhist temple in Kandy. It is one of the holiest shrines in the Buddhist world. Inside the temple is sitting an entire gold buddah statue where you can leave an offering. A place full of peace, quiet and where you will learn a lot about buddhism history. This park is located 165km from Colombo and has been built to provide a safe place for primarily water birds and elephants. So, elephants are probably the first mammals you will see. But if it’s your lucky day, you may see a Sri Lankan Leopard, a Sri Lankan sloth bear and a lot of crazy monkeys, majestic birds, strange fishes and huge crocodiles of course! Sigiriya, also known as Sinhagiri, is an old rock fortress located near to Dambulla (central province). The name means “the Lion rock”, referring to the massive column rock of nearly 200 meters high. You will be able to see, once you will be on the top of it, beautiful colorful frescoes. And on a small plateau, about halfway up, there is two huge sculpted lion paws as it was the begging of an enormous and insane lion sculpture not ended. 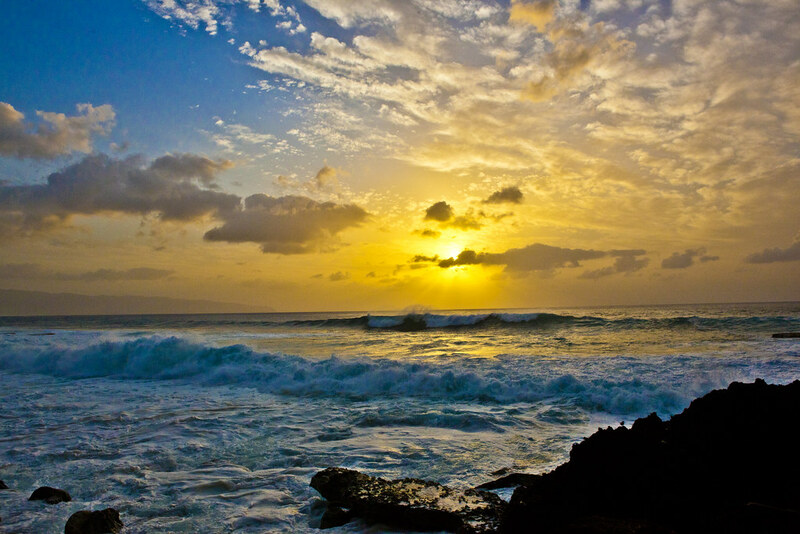 One of the best things you can do is to visit the beaches of the southern region, in the south of the island. Those beaches are especially beautiful and some of them are really quiet! One of the best is Unawatuna Beach. Situated on the south of the island, this beach is exactly the same that you can see on some pictures, and especially really far from the others one! A quiet and beautiful paradise. This place, reaching around 2250 meters high, is one of the highest peak of the island. It is also considered like a holy place by many religions. The ascension to the top is about 3 hours and some 4600 steps but it worth it, especially if you planned to be on the top on for sunset time. This is a mind-bogging spectacle that you will always remember. You’re planning to visit the U.S. this summer and want to enjoy the summer vibe on beautiful beaches without having to cope with the crowd and noise? With around 400 million people visiting American costs each year, the United States offers tremendously various experiences around sea sides. From the exceptional surfing spots in Hawaii to the capital’s yet under the radar oceanfront gems, we will disclose 5 underrated beaches you can visit this summer during your American trip. 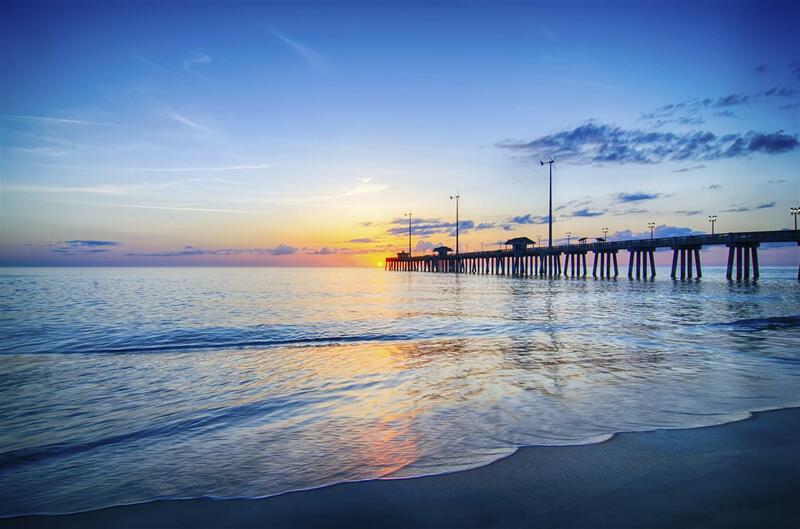 Virginia is well known for its free, clean and well-maintained beaches as well as its Ocean Breeze Waterpark and Aquarium & Marine Science Center. These places might be on your to-do list while visiting the “Old Dominion” but we want to introduce a quieter spot to you. There, you will be able to enjoy some free time laying on a nice golden sand but, above all, some personal space on the beach. 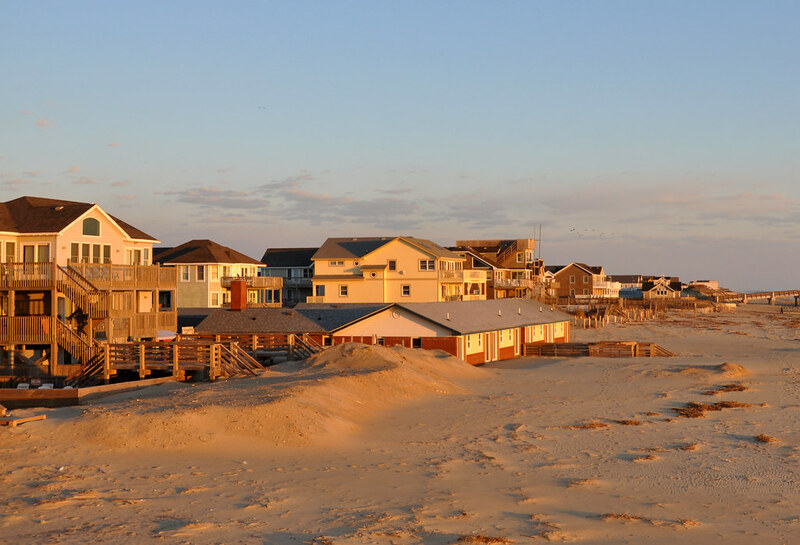 Indeed, Sandbridge Beach – located 15 miles away from the resort area – offers a unique a calm setting for beach lovers. Hawaii is considered as one of the greatest place to be as a surfer and beach lover around the world. With this reputation, it is hard to avoid crowded spots in this legendary island. The sunset beach is one of the best gems you can find in United States “50th state”. Called that way because of the stunning sunsets you can witness once there, this beach is also perfect for both surf and tanning amateurs. Being surrounded by skyscrapers while visiting the Big Apple can make you forget that New-York is also a coastal city. 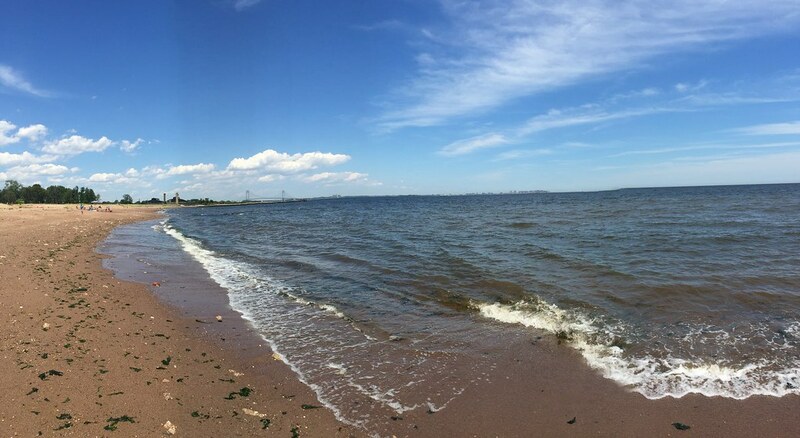 Cedar Grove Beach is a tranquil alternative to some of the other beaches in Staten Island. Located on the eastern shore of the Island, Cedar Grove Beach is New York’s newest beach. It offers a calm atmosphere that you won’t be able to find easily in New-York megalopolis. Nags Head is a quiet and peaceful town located in Dare County, North Carolina. Known for it lighthouse which is the tallest in the country, Nags Head will offer a perfect environment particularly if you want to enjoy some great seafood. Indeed, Nags Head offers many option for you: wonderful seafood restaurants, an annual seafood festival and great fishing spots along the coast. Bellair Beach is a 4500-foot quiet and secluded white-sand shoreline fronting one of the best ocean views in the West Coast. Besides offering a lot of space and a great view to the people enjoying some free time there, Bellair Beach is also a great spot for animal lovers. Turtles and sea birds’ nests are indeed all over the place offering a breath-taking show to the lucky spectators. Whenever we travel to new destinations, we are attracted to the famous buildings there. There are hundreds of well-known structures around the world, and each one of them symbolizes a country, a city, or a culture. Each of these cultural icons is remembered because of its beauty and history. Here we have picked 6 of the most famous building designs that the world would not be the same without. The leaning tower of Pisa is the third oldest building on Pisa’s Piazza del Duomo (cathedral square), the Cathedral and Baptistry were first. The tower reaches a height of 60 metres. Although it was originally designed to be perfectly straight, it started to lean during construction and the tower now leans at about 3.99 degrees. The construction of the Tower of Pisa began in August 1173 and continued for about 200 years due to a series of wars. The tower has eight stories, including the chamber for the bells. In total, there are 297 steps inside the tower leading to the top. Until a few years ago, tourists were not allowed to climb the staircase inside the tower, due to consolidation work, but now the tower is open again and it is one of the most popular tourist attractions in Italy. Taj Mahal is an immense mausoleum of white marble built between 1631 and 1648, and is located on the right bank of the Yamuna River in a vast Mughal garden in Agra, India. The Taj Mahal was built by order of the Mughal emperor Shah Jahan in memory of his favourite wife, and approximately 20,000 people worked on its construction. The name Taj Mahal, which means Crown of the Palace, was derived from the name of Shah Jahan’s wife, Mumtaz Mahal. The design of the building combines Indian, Persian and Islamic influences. The beauty of the white marble and the exquisite ornamentation all make a visit to the Taj Mahal an unforgettable experience. The Statue of Liberty, perhaps New York City’s most famous landmark, is a figure of a robed woman representing Libertas, a Roman goddess, which features 25 windows with a view of New York. Made in Paris, this monument was a gift from France to the United States and is recognized as a universal symbol of freedom and democracy. Total overall height from the base of the pedestal foundation to the tip of the torch is 305 feet, 6 inches. From the tips of her crown to the broken shackles at her feet, the Statue of Liberty is an unforgettable sight to behold. More than 50 designs were submitted for the bridge before the design by Sir Horace Jones was eventually approved in 1884. The bridge crosses the River Thames close to the Tower of London, and is the only Thames bridge which can be raised to allow large vessels to pass through. Over 40,000 people use Tower Bridge every day, but river traffic still takes priority over bridge users. The bridge usually opens at least once a day and about 1,000 times a year. Massive engines raise the bridge sections, which weigh about 1000 tons each, in just over a minute. It is quite an amazing sight! The Sydney Opera House is one of the most famous and distinctive buildings, and an icon of Australia’s creative achievement, with 3,000 events every year. The largest of the seven venues, the Concert Hall, has 2,679 seats. Since its completion in 1973, its design and construction have attracted visitors from all around the world, enhanced by its location on Bennelong Point within a superb harbour setting. The roof is covered with more than 1 million tiles made in Sweden, and the building has 6,225 square metres of glass and 645 km of electric cable. And of course last but not least, with a total height of 829 m, Burj Khalifa is currently the tallest structure in the world! It is three times as tall as the Eiffel Tower and nearly twice as tall as the Empire State Building! It has the longest single running elevator, which is 140 floors and goes 10 meters per second! Only one word comes to mind when you see this building: awesome! We all have already dreamed about this place. The state Arizona, located in the southwest of the USA, is known for its desert climate with very hot summers and mild winter. More than 25% of the country is the home of 27 different Native American tribes including the Navajo! Most parts of this area still look like the landscapes you have seen in classics movies like Once Upon a Time in the West or 2001, a space odyssey, and you can imagine how it feels to be there (crazy). We have selected for you 5 insane places to see there, so your road-trip will be unforgettable. The first one is the Saguaro national park, in Tucson. Because you have already saw this place in more than 40 western movies such as Rio Bravo or Little House on the prairie. This is just a breathtaking scenery, full of huge cactuses and desert views. This place is just amazing but can be a bit dangerous: there are some rattlesnakes in the area, watch out where you walk! It is one of the most amazing places to hike! And you can go there by helicopter as well! It is exactly like you have seen it in the pictures: spectacular, with clear, light blue waters and a huge and powerful waterfall above the main pool. It is better to swim in the other swimming holes downstream. A place where you can spend an entire day chilling! “The world’s best-preserved meteorite impact site on Earth” is there, in the middle of the northern Arizona desert. This crater is 1km diameter and 170 m deep. It crushed there 50000 years ago at an average speed of 12 km/h! A platform has been built along one side of the crater to observe its astonishing majesty. People who have already been there once or even ten times know what it is about. It is about breathtaking views, surprise, fascination, beauty, fear, wonderment and freedom. Pictures speak for themselves.